Best-selling novelist and non-fiction writer Lee Gruenfeld has been entertaining the triathlon world with hilarious essays, in-depth profiles and insightful observations for more than a decade. Now his best writings have been collected into a single volume, Stumbling Towards the Finish Line. This collections will let long-time fans relive their favorite pieces while introducing new readers to his unique voice. Anyone who likes sports – any sports – and great writing will love this assemblage of amusing, penetrating, and often totally off the wall observations. 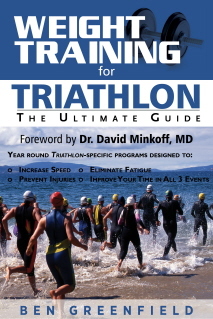 Triathlon: Half-Distance Training offers a great amount of detailed training plans. There are in-depth examples of core and peripheral training and heart-rate dependent pace levels T1-T8, which help to illustrate the year-round training recommendations. Weight Management for Triathletes is a book that every athlete struggling to keep that optimal weight needs. Triathletes work hard to move faster in each triathlon event. They strive to be successful in the competition. They additionally desire to be leaner. Unfortunately, for many athletes, training is not enough. They must pay attention to their diet as well as the training volume they need to achieve their optimal weight.